There are a large variety of places in The Elder Scrolls Online spread across Tamriel and beyond. This page lists the most important places sorted by type, as well as a list of zones. See Maps for an overview of the icons used for different types of places, and for other available maps in the game. Khenarthi's Roost — A small island off the coast of Elsweyr inhabited by both Khajiit and Maormer, named for the Khajiiti goddess Khenarthi. Alik'r Desert — A region along the northern coast of Hammerfell. Betnikh — A small island off the southern tip of High Rock, with steep cliffs and a lush, fertile interior. Rivenspire — The northern region of High Rock. Stros M'Kai — A desert island off the coast of Hammerfell. Bal Foyen — A small coastal zone neighboring Stonefalls in mainland Morrowind. Deshaan — A region in southern Morrowind. Stonefalls — A zone in central Morrowind. Artaeum — A mystical island, home to the Psijic Order. Clockwork City — A mechanical realm created by Sotha Sil, one of the living gods of Morrowind. Gold Coast — A region situated in western Colovia, between Hammerfell and Malabal Tor. Murkmire — A region situated in southernmost Black Marsh, south of Shadowfen. 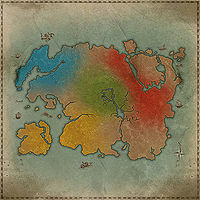 Summerset — A large island off the southwestern coast of mainland Tamriel. Vvardenfell — A large island located in Morrowind's Inner Sea. Unzoned — A listing of places which are not part of any zone or their associated storylines. This page was last modified on 19 January 2019, at 22:34.